This guided tour by golf cart is a unique way to get a unique perspective of our city. Charlotte has an incredible selection of microbreweries throughout the city and the scene is quickly growing. Sit back and relax with your friends while we take you on an exciting tour of our 3 favorite breweries in Charlotte. There will be one complimentary drink included on the last stop of the tour. You can also enjoy a variety of local beers on your own as well as live music in three very unique neighborhoods in the area. Choose one of our multiple departure times that best fits your schedule. 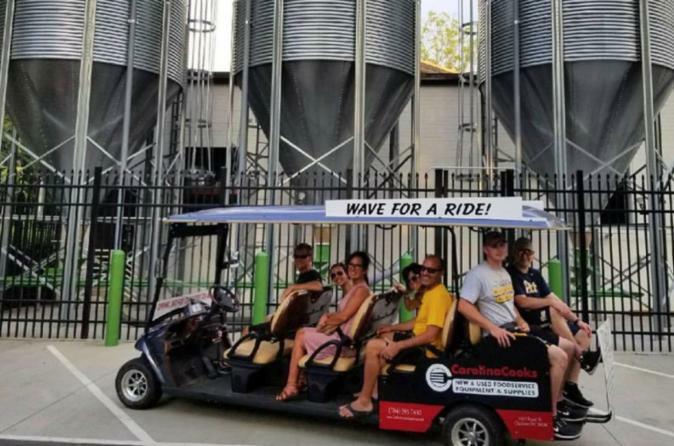 Your tour begins by meeting your guide at Fitzgerald's (201 East 5th St., Charlotte), where you will set off on your tour of local breweries by golf cart. During the tour, you will visit three of our favorite Charlotte breweries and spend an hour exploring what each brewery has to offer. During your final brewery stop, you will receive one complimentary beer voucher. If you wish, you are able to purchase additional beverages or food at each location. Your guide will provide you with commentary on the breweries and the neighborhoods they are in. Depending on availability, you may also be able to take a tour of one brewery or have time for a Q&A session with a brewmaster.